The classic “double progressive” overload technique involves adding weight and / or increasing the number of reps from the previous workout. The T.N.T. system adds a third component, time under tension. This third component then creates the T.N.T. Triple progressive overload process. This is essential for direct accountability of accurate strength gains, perfect reps, and eliminating non-productive sets. 3. Increase Weight & Do Not Cheat! 1) Increase Time under Tension – Time under tension refers to the amount of time the muscle(s) is being stressed (overloaded) during a set. The muscle should never relax at any time during the entire set. The recommended time under tension per rep is 6 to 10 seconds, 3-5 seconds for the concentric or positive movement and another 3-5 seconds for the eccentric or negative. Therefore, if a client sets a rep range between 8 to 12 reps, the time under tension range will be between 48 seconds (8 reps x 6 sec.) and 120 seconds (12 reps x 10 sec.). Example: a client executes 10 perfect reps to MMF on a standing barbell press, with 100 pounds, and the total time under tension was 60 seconds. The recommendation for the next workout would be to stay with the 100 lbs and increase the reps to 11 or 12 and or increase the time under tension to 66-120 seconds. A minimum speed of 6 seconds per rep is acceptable under these guidelines. The following is an example of a client that performs more reps but actually less work. During Monday’s workout the client uses 100 pounds in the standing barbell press and executes 10 reps in 100 seconds. The average rep speed was 10 seconds. The next workout, two days later, the client uses 100 pounds again in the standing press and performs 12 reps in 60 seconds. The average speed per rep is 5 seconds. This is below the acceptable rep speed guideline for TUT, and was 40 seconds less than the time under tension performed on Monday. The client is convinced that they got stronger due to the fact that they performed two more reps than in the previous workout. However, because the time under tension was 40 seconds less, and the resistance was the same, the client did not increase the overload intensity. The difference was that the client used greater momentum and performed less work (reduced tension) per rep during the set. As a result they actually performed less work. The bottom line is that the T.N.T. Triple progressive overload system requires specific guidelines that must be understood and practiced in order to achieve maximum strength gains and have direct accountability of strength improvement with each set. Accurate records are essential. Based on the above example, the following is the correct approach: The client should keep the weight at 100 lbs. for the next workout and try to exceed the time of tension, 100 seconds, to failure. This would show accountable strength gains and will ensure that the client does not cheat by adding more momentum to the set. 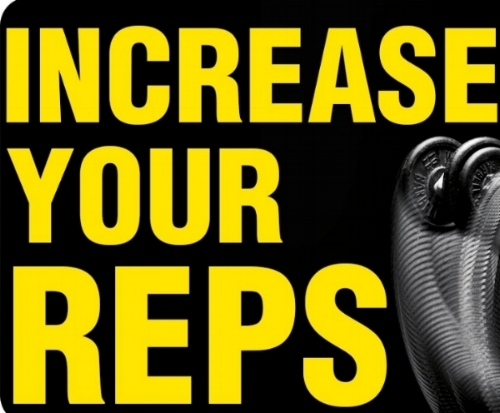 Most clients are not even aware of their rep speeds and will average 1.5 to 2.5 seconds per rep. Performing reps at that speed will minimize muscle recruitment and limit the client’s ability to maximize strength gains through the full range of motion. I realize that it may not seem practical to use a stopwatch to time every set. However, I do highly recommend that the client and trainer use a wristwatch and or a small metronome to get a rough idea how long each set takes to complete. The client needs to experiment with time under tension because there is a dramatic learning curve that must be experienced if the program is going to be successful. 2) Increase Reps – Set a rep range and focus on reaching the high end of the rep range during the set (refer to table A below). In addition, there must be a time under tension range that corresponds with the rep range. For example, a client sets a rep range from 10 to 12 reps which would correspond with a time under tension range between 60 sec. (10 reps x 6 sec.) and 120 sec. (12 reps x 10 sec.). If the client performs 10 reps in 65 seconds the average rep would be 6.5 seconds. The next workout the client is going to try to reach 11 to 12 reps, with the average rep time of 6.5 seconds or greater (72 seconds). I believe that all clients should be motivated to increase reps during every workout. However, the client must be aware of the “time under tension” variable as they continue to increase reps because eventually they will hit a strength plateau and time of tension will be the most important variable. The average increases should be between 5-10%. Usually 10 % for double-jointed movements and 5% for single-jointed movements is a safe guideline for the majority of clients. Make sure that the increase does not affect the client’s ability to perform perfect reps within the low end of the rep range and time under tension range. The T.N.T. Triple progressive overload process is an excellent way to accurately assess whether there is actual evidence showing direct accountable strength gains. Again, it is worth repeating, timing sets is not easy to do but will help educate the client, and trainer on how to perform perfect reps within the time under tension parameters. ***NOTE: It is recommended that for most training goals it is best not to exceed 90 seconds TUT in any one set.